Lock in a great price for RYSE, Autograph Collection Marriott - rated 9.3 by recent guests. Awesomely styled, great interior, very artsy. Great bed quality. very convenient location, staff at front desk are friendly and helpful. Great location, clean rooms and exceptional service from Sunny! The location was great and it was easy getting around because the subway and bus stops were all just easily accessible around the hotel. Staff were very helpful and friendly, and breakfast was delicious with some variety of international and local choices. Room was very comfortable and interior design was very classy and modern - boutique-like hotel. The hotel itself is aesthetically pleasing a very modern feel but with all aspects of customer comfort needs taking into consideration. The Staff were very helpful and welcoming all done with natural ease. We arrived late at night and they were very kind to upgrade our room. 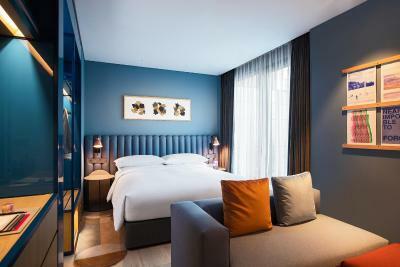 Rooms are very nicely designed and spacious, with a great colour scheme. 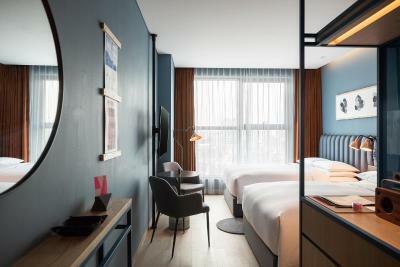 The hotel is in a great location in the hustle and bustle of The Hongdae area with a variety of restaurants, bars and great shopping offerings. It is also a short walk to the nearest subway station. 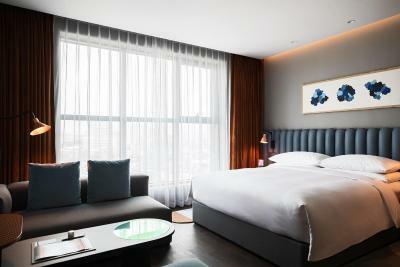 Perfect hotel in Seoul - located in a very vibrant area, surrounded by local restaurants, it offers perfect own restaurant, bar. Rooms are comfortable, modern. Staff is friendly and full of assistance. One of the places to come back again! Great vibe and very friendly and helpful team ni reception. 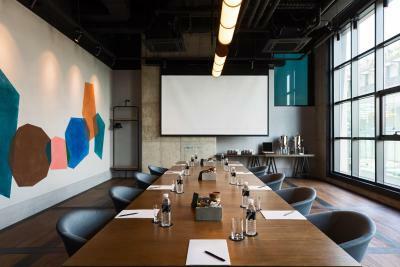 RYSE, Autograph Collection is located in the bustling Hongdae district, 350 yards from Exit 9 of Hongik University Subway Station (Line 2, Airport Railroad and Gyeongui-Jungang Line). Free WiFi, valet parking and 24-hour room services are provided at the hotel. Each room here is fitted with a flat-screen TV, Bluetooth speakers and a safety deposit box. Private bathroom comes with a walk-in rain shower and bathrobes. Staying guests can freely access the on-site fitness centre, business centre and library. There also are meeting rooms which can be used upon reservation. Daily breakfast is served at Long Chim, where Thai cuisine is featured for lunch and dinner. Coffee and snacks are available at Tartine. In the evenings, guests can enjoy music and alcoholic drinks at Side Note Club. 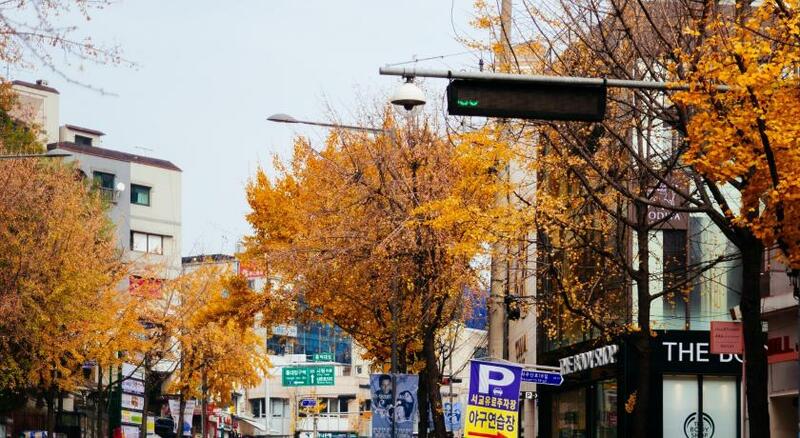 From the hotel, Itaewon is 4.7 miles and N Seoul Tower is 5.6 miles away. Gimpo International Airport is a 20-minute subway ride, while Incheon International Airport is a 55-minute subway ride away on Airport Railroad Line. RYSE, Autograph Collection Marriott has been welcoming Booking.com guests since 11 Jun 2010. When would you like to stay at RYSE, Autograph Collection Marriott? This twin room has a minibar, cable TV and seating area. House rules RYSE, Autograph Collection Marriott takes special requests - add in the next step! RYSE, Autograph Collection Marriott accepts these cards and reserves the right to temporarily hold an amount prior to arrival. Please note that the name of the credit card holder must be the same as the guest's name and the same credit card used to guarantee your reservation must be presented to the hotel upon check-in. The hotel reserves the right to reject guests check in without the presentation of the original credit card with designated signature. If a different credit card is presented, the hotel may void the previous charge and make a new charge on the presented card to avoid any disputes. Please be aware: no spa or sauna area. The staffs were incredibly friendly, nice and helpful. Most of them speaks good English. Recommended us some really good places to eat. Best concierge service we’ve experienced so far. Really happy with our stay. Location is excellent. maybe my trip is too short. Location is great. Bakery and staff are great. Not much, but elevators were a little bit slow. The staff was so accommodating and anticipated our needs. The room cleaning service is the worst we’ve ever experienced. One day the cleaning service forgot to clean our room, and the other day they left a dirty cleaning towel (still with dirty water )on our clothes. Room was pretty small, and the downstairs cafe area is public and so crowded all the time. The check-in time was quite late from 3pm, and we were only allowed to check in earlier if we paid another night’s rate, or if we upgraded to a more expensive room. We chose to upgrade - that said, the upgrading fee was fairly reasonable and much cheaper than if we were to pay another night’s rate to enter our original room earlier. I think the price of the breakfast was very expensive and was not value for money. - cleaning staff were really funny! They would come to clean but not finish the job properly. I have to call them again and again to come clean the room properly. They forget to restock the room with water. They also don’t pick up the empty bottles. Some staff would frown when u point their faults out and some would apologize on behalf of their collueages. I also have notified the hotel not to put anything on the room and yet by the time I check out there’s a remaining balance needed to paid. And one funny thing that happened, the cleaning ajuma who came to pick up my plates .. she took a photo of the tray and left it there !!! Some stuff where nice. The check in was smooth. They recommend a nice nearby spa and walk you there. They also left a delicious snacks in my room.